The Mobile Health Unit (MHU) is a multidisciplinary research unit in the domain of Mobile Healthcare. In May 2012 the MHU was established as part of the Limburg Clinical Research Program (LCRP) a structural collaboration between Hasselt University, Jessa Hospital and Hospital East-Limburg. The MHU aims to combine the fundamental knowledge available within the various research groups of Hasselt University with the clinical expertise in both hospitals to leverage mHealth research activities. Given the multidisciplinary character of mHealth research, we collaborate across different research disciplines in order to achieve a comprehensive view on mHealth. Hasselt University research groups and institutes provide expertise in medical, clinical, technological and socio-economical aspects of mHealth. The close collaboration across the three partner institutes results in an already extensive portfolio of mHealth projects. Those projects are all related to the mHealth innovation cycle covering fundamental and applied research, new technology development, technical and clinical validation and services for mHealth companies to stimulate economic valorisation. All our activities are in close cooperation with patients, healthcare specialists, academics and businesses. Our focus domains are mHealth Research, mHealth Innovation and mHealth Business. We investigate the added value of mobile technology, mobile applications and services in healthcare. We believe that mobile innovation may empower patients to actively self-manage their health, may increase the quality and safety of care and may reduce healthcare related costs. Strategic basic research – Researchers from Hasselt University perform strategic basic research on different topics which can be related to and interesting for the mHealth domain. E.g. research on new disease biomarkers, new wearable technologies for continuous monitoring, new prediction models & algorithms, quality of care indicators, cost-effectiveness models etc. Applied research – The Mobile Health Unit aims to “combine and apply” the fundamental knowledge available within the various Departments of Hasselt University to support mobile health related activities and research projects within the hospitals East-Limburg and Jessa. Also applied research in cooperation with industrial partners or the government is possible in the form of contract research or by applying for grants at external funding agencies. The focus of our research projects is on the “remote care cycle” as shown in the illustration below. Patiënts at home are equipped with various sensors to collect patient specific and contextual information. Those sensors can be invasive (pacemakers, ICD or CRT-D/P) or non-invasive (weight scales, devices to measure blood pressure, blood glucose, urine composition, wearables to measure physical activity, body temperature, bioimpedance, ECG, heart rate, …) or can be mobile like medical smartphone applications to collect information on location, emotional mood, eating behaviour, etc. 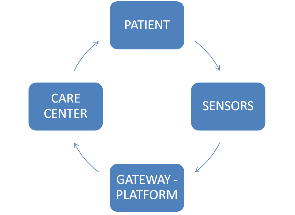 All patient data (physical, physiological, contextual and environmental) are gathered by a generic healthcare hub or gateway, compatible with various types of sensory systems (often the smartphone). This gateway sends the data to a remote, cloud based platform needed to perform academic and clinic research on the topic of telemonitoring and data mining techniques essential for personalized and predictive medicine. A care center (health professionals, nurses, carers) can consult the data and provide patient feedback. Through the generation, dissemination/transfer and valorisation of new knowledge, the MHU aims to close the gap between knowledge, technology and the clinical practice. Co-creation and validation of new mHealth technology with external research institutes and industrial partners. The MHU develops, validates and implements mobile health technologies and applications. By committing to prototype development and offering a clinical living lab to test new products/processes under scientific supervision, the entire mhealth innovation cycle, starting from idea to product, is covered. A prototype development lab is a lab where cheap and rapid development of hardware and software prototypes for care applications can take place. In this lab, we facilitate an intensive cooperation between companies, hospitals and researchers to develop new products and services or to optimize existing technologies in order to better meet the current needs in the healthcare sector. This multidisciplinary environment will accelerate the process of ‘idea’ to ‘ready-to-use product’. Additionally, this lab can serve to ‘technically’ validate new/existing technologies or products, before testing them in a real life setting, such as clinical testing ground. For this the MHU collaborates with the Faculty of Industrial Engineering of Hasselt University, with the PXL-IT and PXL-TECH departments of PXL, with the technical engineering students of UCLL, with Microsoft Innovation Center (MIC) and with Imec Holst centre. In recent years mHealth has emerged as a complementary way of delivering healthcare building on the ubiquitous connectivity of mobile networks and the proliferation of smartphones and tablets. The MHU aims to support innovative services, start-ups & the app economy. The first spinoff company of the MHU, Qompium, was established in 2014.Through our mHealth community platform and clinical living labs we enhance bussiness development and valorisation. The mhealth community provides a platform and point of contact for all stakeholders in mHealth like healthcare facilities, other universities and research institutions, industry, federal and state government entities and health insurance companies. Together with LifeTechValley we organize networking facilities & symposia. The clinical living labs for in-hospital validation of new technologies & services are located in Jessa Hospital, Hasselt and Hospital East-Limburg, Genk. Also other regional hospitals can be involved through HospiLim. The MHU collaborates with CAREVILLE – Moving Care, a living lab in the Province of Limburg, which facilitates testing innovative health services in real life situations. The focus of this living lab is on the elderly population (‘healthy ageing’). The Mobile Health Unit is partner to plan, set-up and scientifically support clinical pilots or clinical trials like e.g. randomised controlled trials (RCTs) to validate new products, services or pathways in the domain of mobile healthcare. We also apply for grants at (EU) funding agencies. The MHU offers services for companies in the form of contract studies. For all actions concerning technology transfer or business formation we get legal advice & support from Hasselt University Technology Transfer Office (TTO).